I am sure there is no Mumbaikar who hasn’t heard of Bhajji Pav, but for the non-Mumbaikars out there, Bhajji pav is nothing but aloo bhajiya pressed in a pav brushed with chutneys. In Mumbai, this Bhajiya Pav is a street food you can find on every corner of the street, mostly on the vada pav stalls. Crispy fried bhajiyas when clubbed together and stuffed in a Ladi pav, in itself is a treat. 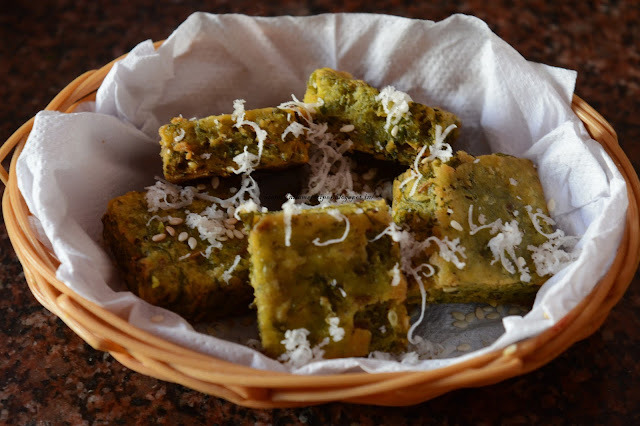 When this delicious snack is served with chutney & fried chillies, it is sure to make the onlookers mouth water too. Bhajiya Pav is not among the healthiest snack but you can make them less unhealthy by making them at home. Nothing made in a clean, hygienic, homely environment with fresh veggies and refined oil can be as unhealthy as a road side snack. Thus, whenever my little one demands fried snacks, I make them at home. Use coriander green chutney to serve these bhajiya pavs as they enhance the flavor even further. This is an excellent snack to enjoy during the heavy pouring days. For similar Maharashtrian Snack Recipes, check: Vada Pav Recipe, Palak Bhajiya Recipe, Batata Vada Recipe, Matar Bhajiya Recipe, Kanda Bhajiya Recipe, Suran Bhajiya Recipe. In a mixing bowl combine the besan, red chilly powder, turmeric powder, salt and little water to make a smooth batter. Wash, peel and slice the potatoes. Heat oil for deep frying, dip slices of potatoes in a batter and drop them into hot oil till they turn to golden brown in colour and crisp. Make all the remaining bhajjis and keep aside. Take pav slit it and apply both chutneys from inside. Arrange 5-6 bhajiyas over chutney and cover with the upper side of the pav. Serve hot with fried green chillies. 1) In a mixing bowl combine the besan, red chilly powder, turmeric powder, salt and little water to make a smooth batter. 2) Wash, peel and slice the potatoes. 3) Heat oil for deep frying, dip slices of potatoes in a batter and drop them into hot oil till they turn to golden brown in colour and crisp. Drain them. 4) Make all the remaining bhajjis and keep aside. Take pav slit it and apply both chutneys from inside. Arrange 5-6 bhajiyas over chutney and cover with the upper side of the pav. 5) Serve hot with fried green chillies.